Okay, I admit it. This blog is not about writing or reading. It is, however, about something critical to the creative process: what you eat while you watch your favorite mystery. My taste in mysteries and suspense runs the gamut. I have a special place in my heart for the BBC. I’ve watched all 19 seasons of Midsomer Murders. I love Endeavor, Shetland, Loch Ness, Luther, Inspector Lewis, Foyle’s Wars, Wallander, Agatha Raisin, Inspector Lynley, Father Brown, Jonathan Creek, Zen and anything Agatha Christie old or new. I also happily watch Winter and Miss Fisher’s Murder Mysteries for a taste of Australia. New Zealand has The Brokenwood Mysteries. Then there’s Elementary, Psych, Longmire and Bosch for something with an American accent. I could go on, but I won’t. While the shows may change, my snack of choice does not. It’s always popcorn. If I’m watching by myself, the topping will be whatever strikes my fancy. If I’m curling up to watch a mystery with my daughter, we tend to top our popcorn with truffle butter and parmesan. If I’m watching with my son, it’s frequently butter mixed with hot sauce from Belize. (My sister-in-law is Belizean and introduced the family to Mary Sharps. Our lives have never been the same.) If I’m making popcorn for the entire family, I usually stick to the classic butter and salt. I find high-fat, cultured butter is best because it has, to my taste buds, the right ratio of fat to milk solids. Vermont Creamery Cultured Butter is one of life’s true pleasures. My salt of choice is Baleine coarse salt ground in a salt grinder, but I’ve had great results with black salt from Maui and pink Himalayan salt, as well. 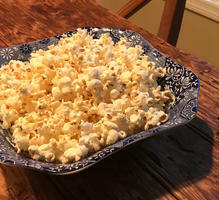 I use an old air popper, carefully drizzling the melted butter on the popcorn as it drops into the bowl. When all the popcorn is popped, I add eight to ten turns of ground salt and place another bowl on top so that I can shake the popcorn until the butter and salt (or parmesan) are evenly distributed. For me, there’s nothing better. It can be a meal in itself…and has been more times than I should confess. Having said that, I’m always on the prowl for both new mysteries and new snacks. So, what do you watch, and what do you eat while watching it?